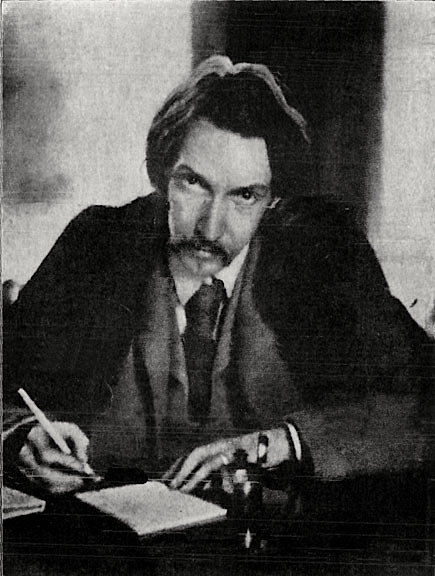 An Interview with Robert Louis Stevenson. IT HAS BEEN THE fortune of but few writers to at once attain the book-stall notoriety and win the regard of men of letters enjoyed by Mr. Robert Louis Stevenson. Some toilers in the field of literature have cut a wider swathe, and some can show a goodlier stack of the golden straw which is their labor’s secondary compensation, but none has plowed the soil more deeply or garnered a more rich a various harvest. And he has shown himself singularly free from a farmer’s vice — the idle trick of turning from productive toil to criticise the agricultural methods of his neighbors and compare their corn with his. The portrait is from a photographic image by Lloyd Osbourne. With, however, the kindliness of a skilled soldier who admonishes a camp-follower, he has, on two or three occasions, indicated to the writer some of the distinctions between good sword-play and mere battery. And, with his reluctant permission, I have of these wayside words made some semblance of the thing he most abhors — an “interview.” The verse printed beneath his portrait is by Mr. William Ernest Henley, and — bar a touch of friendly malice — is an exceptionally close word picture. Mr. Stevenson has early this morning weighed anchor for a long cruise in the South Seas, so that it is permissible to add a word of prose to these two portraits. No man bears more plainly on his face the mark of his vocation: genius and many-sidedness are written there with heavy hand — the pen almost tearing the paper. His eyes and many of the lines in his face, are like a woman’s, and yet he looks intensely energetic. Withal, a suggestion of latent lawlessness, an “if I thought I ought to kill you I should do so” about the man, is in curious contrast to his active kindliness and tolerance. The marks of illness, too — but this is a sad part of a bright picture; let it suffice to say that the physician who attended Mr. Stevenson ten years ago declares he is no worse to-day than then. Mr. Stevenson is not an admirer of what the Saturday Review called “post-card journalism,” the inquisition of a census of opinion. The man who asks him for his ten great writers, hundred best books, or thirteen most approved remedies for St. Vitus’ dance, will discover that there are but two approved methods of leaving a room, the door way and the window way, and he will wish there were twenty, so eagerly will he flee from the wrath to come. But people who are at once frivolous and crafty can get a short list of Mr. Stevenson’s favorite novelists by noting them one at a time. At another moment Henry James’ name was dropped upon the stream of his quick thought by some side wind of allusion. One could not but remind Mr. Stevenson how widely “Princess Casamissima” and his own “Kidnapped” differed in their genre, the one lying in the cool white light of an etcher’s screen, the other glowing with the air of out-o’-doors, fierce with incident. One told Mr. Stevenson how the country schoolboys in Australia put corrosive sublimate on the great hills of the “bulldog” ants, and watch the creatures run mad, heaping one upon another in the melee till there is a solid ball of ants as big as one’s flat, writhing and fighting — and suggested the exhibition of this Kilkenny-cat remedy to the ignoble who dwell in houses. IT MAY BE DOUBTED if a keener literary emotion exists than that evoked by hearing Mr. Stevenson discuss style. For the disquisition is its own example and illustration. Phrases at once intricately ingenious and classically simple insert themselves as if by a collusion of the fates: it seems a jugglery that a man should speak such considered prose. One fancies, almost, that if Mr. Stevenson rewrites his essays seven times for “structure” it is done in wantonness; that a mere shuffling of the sheets would effect the rearrangement, and that nothing of word changing could improve his diction. “My special distaste,” he says, “is the use of any foreign word. Often and often I set one down as a memorandum. When I come to go over the work again, although it sometimes takes me a long time, I think I never fail to express the idea clearly in honest English. What sort of English word I use is a matter of the very slightest moment to me, so long as I can get the meaning close and so long as the word is in the key of what I am writing. This question of key is—I am afraid it is really incommunicable. A good example of a key perfectly held, perhaps as good as I can name, is the Church of England prayer-book. There does not seem to me one word in the whole of that which is not of near aesthetic kin to all the rest. “What do you think of the fellows who go to Roget’s ‘Thesaurus’ in order to annex an incongruous wing to their ramshackle vocabulary? “The great instance of that sort of folly was Gautier, who is said to have read the dictionary for some time every morning. I don’t know if the story be strictly true, but yet I always think I can see that it was true when I read his work. It is a fact that whenever a writer comes across a word that is new to him he should make a strong effort to fix it in his mind, because some day it will come handy. But he must take great care to do so with its connotations, so that it shall be called up the harmonic of a note as soon as his mind comes upon the subject which it really suits. “Not very long ago I was rather shocked to be told by one of my readers that not only she (for it was a lady), but quite a committee of literary friends had been driven to the dictionary. I have no wish to do this: but at the same time I am not going to make a fetish of my reader’s dullness. I try to write fair, square, expressive English, and to express my meaning at the moment as sharply as I can get the words to fit it. If the reader does not understand I am very sorry for him, but he will not be the least sorry for himself. The same person who is graveled by my humble eccentricity will doubtless pretend to read Shakespeare with enlightenment; and if you want a tough vocabulary commend me to Shakespeare. The same reader, English born and English bred, will profess to extract the keenest delight from the hardest passages in Burns, and if he has a little tincture of French you will find him speak with instructive glibness of the works of Villon. From all this I gather that readers do not want to understand that they are perfectly pleased if they can roughly gather the drift, that perhaps even when they come to a word they do not understand it gives them a certain sense of dignity and they go about their affairs rather proud of having been studying a work above the average. But I may as well tell you frankly that whether or not the public takes any interest in me, I take, I may say brutally, none in the public. I do not believe they like my literature or any man’s art for any artistic quality. I do not blame them for this, I think I admire them; but it cannot be denied that it makes their opinion eternally uninteresting to the artist. MR. STEVENSON’S WORDS HAVE been noted with almost literal accuracy—and one cannot but be impressed by the similarity of his talk to his work. The quaint turns of phrasing, the happy extraction of fresh metal from a word which other men would think had been tortured out of everything but the useless quartz, are not, plainly enough, the result of study—they are flashes of spontaneous ignition, appearing in the quiet evening of desultory chat as often as in the set show of a book. One could not but remark this, with the comment that work must be easy to a man who ordered his dinner or muttered in his sleep with epigrams. “Ah, you don’t know what toilful work mine is,” said Mr. Stevenson. “Talk is one thing, writing another. It is not the plums in the cake that cost the confectioner his labor, but the making of the cake. The plums stir themselves in, if the cake is careful cake. In an essay, as in a story, structure is the great thing. Arranging an essay is a most dreadful business. These recent essays of mine in Scribner’s, although I have been hurried over many of them and don’t think them at all up to the mark, have been rewritten seven or eight times. The only living man from whom I believe myself to have received direct tuition in literature is Sidney Colvin, who used to call me ugly duckling, and promised me fine feathers in the future. He actually lectured me on the subject. I used to take my manuscript to him to be picked to pieces, and when I brought him a thing I had been filing up to the nines and had stuffed full of pretty sentences and all the rest, Colvin would wag his brows over the thing and begin to pull paragraphs from the end to the beginning and from the middle to the end with the most miraculous improvement in clarity and significance. “Now, for instance, in a story (which is simple when you get started), almost the whole point is to know when to begin. If you have the moment, the real starting point (which is never the beginning) and have got four pages with the degree of detail that will suit, the problem is solved. In that starting point there is something that appeals to me almost as a fate. The number of stories—long stories—that I have laboriously planned out and begun upon the wrong foot and simply been obliged to stop, makes a dismal retrospect. For instance, I am rather fond of the first person. I am rather fond of it for two reasons. The first is it enables you to get in one the characters with a great deal of finish, and a great deal of simplicity. The other I am rather amused to talk of, because it flies right in the face of the common opinion. It is generally supposed to be more difficult to write in the first person. Now, any writer who has even thought for two seconds of his trade knows that his chief difficulty comes in about the pronouns. In any rapid, intricate piece of narrative the ‘he’s’ and the ‘hims’ get inextricably knotted up. Thus the blessing of the first person; you have ‘I’ and ‘me’ to change off with. Really, when I think of it, I am surprised that I do not force myself to put more women in my stories, if it were only for the purpose of having ‘she’ and ‘her.’ Pleasant in hand as the first person is, it has its limitations. I have often killed a story (in the first three pages, as usual) by committing myself unsuitably to the first person. “What strikes me so much about all this is, that it is very hard to criticise. I specially pride myself on this, that even when I used the third person I always try for every chapter or every set of chapters to keep the point of view of one of the characters, and to describe only what that person might have seen, because I am myself exceedingly sensitive to that question, ‘How did he know this?’ and it has spoiled my pleasure in many books. At the same time, the first duty of the narrator is to get along with his business. If by any light straining of probability of that kind he can spare the reader a page or two, I think he would be a bold man who would condemn the convention. Merely conventional dialogue, such as is often necessary in drama, and such as Victor Hugo grossly abused in his novels, will often save a lot of space, and, really, the more one thinks of the shortness of life the less inclined one is to condemn the artifice. “Please do not think it is the writer’s time I am thinking of; he must be willing to give himself five hours’ work to save the reader five minutes. It all comes back to the same point, the necessity of laborious structure. In an idle hour’s gossip, like this, there are the disjecta membra of an essay for Scribner’s—more than one, perhaps, one wanders over an unconscionable field at a lazy gait—but to make an essay of it there would be wanting a beginning and an end; the whole must center about some leading idea, the points would probably require to be shifted to and fro and up and down before their full significance could be brought out; and when all that is done—to let you into a trade trick of mine—I should, in nine cases out of ten, try to work in some passage of description, some reminiscence of my own past, which (with whatever genuine connection with the subject) should be the sugar-coating of the pill. I am a good deal chaffed about being autobiographical in the essays, but now you see why it is done. ALL THIS, IT SHOULD be remembered, is a sick man’s talk—a man bedridden, half the time, in pain always. If only men in health all thought as robustly! This article was published in June 1888 in the San Francisco Sunday Examiner, and republished in an altered form by the Pall Mall Gazette in August of the same year. This web version transcribed manually from the archived pages of the Examiner for the New Series. This is its first appearance in any medium, other than microfilm, since its initial publication. Please note The Fortnightly Review [New Series] and fortnightlyreview.co.uk in citations based on this transcription. For more encounters with RLS, consult Prof. R.C. Terry’s Robert Louis Stevenson: Interviews and Recollections (1996). Publication: Saturday, 14 November 2009, at 04:34.